Editors Note: There is a photo included with this release. Stefan Hansen from Norway has lifted the first European Masters of Poker season III title after besting a 213-trong field in Gran Canaria at the weekend. He took down €34,160 for his victory in the €1,100 buy-in event at the Casino Las Palmas in the Canary Islands after a four-handed deal saw him receive the smallest portion of the prize pool. Hansen beat Yohas Avidani from Israel heads up after pushing all in with 6-6 and getting called by 3-3. The board fell K-9-2-A-K and Hansen scooped the additional €10,000 and the title joining last year's winner Maciej Lipny of Poland as Gran Canaria champion. The tour now gears up for its second stop in Casino Estoril, Lisbon, Portugal from March 23 to 26, 2011. 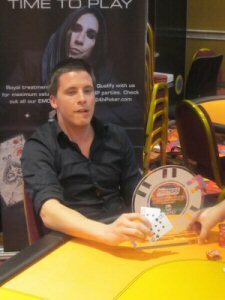 For more details visit www.europeanmastersofpoker.com. EMOP is a live poker tournament series running in Europe. EMOP gives the recreational player opportunity to play big international poker tournaments with affordable buy-in. EMOP chooses to cooperate with the best casinos in Europe to give the participants an unforgettable experience. Partners in the Entraction poker network will send at least 200 qualifiers to each event. The European Masters of Poker gives the gaming operator a unique possibility to create ambassadors for and loyalty to their brand. EMOP is a wholly owned subsidiary of the Entraction Group. Please visit www.europeanmastersofpoker.com for more information.